Heart Handmade - Crafts, craft ideas and arts and crafts blog: I Spy... ME! "House Rules" is my first craft-collaboration with the mister Hillsy. He came up with most of the rules, quite surprising since I'm usually the one spitting them out at home! 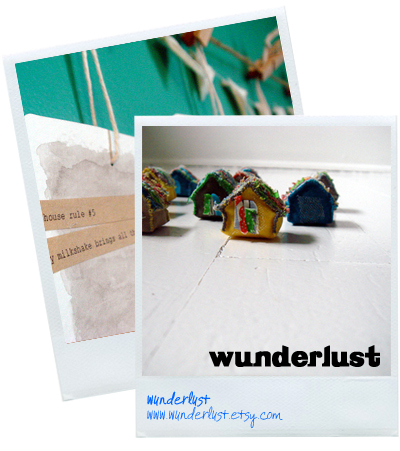 I hope you enjoy browsing around the shop www.wunderlust.etsy.com today! I bet it felt great to get your creative fingers and juices going! Pretty work Marichelle!! fabulous, fabulous, and even more fabulous! I've said it before, but I love these!! So cute, Marichelle! What a perfect house warming gift. so great - i got mine and left my monthly budget in the dust! YAY! I am so glad these are finally up! They are so adorable, even more so in person! I love, love, love mine and wish I could have a whole village! YAY! These are fabulous! The little cards themselves are beautiful too! I wonder if it's a sign of the precarious financial times - we all feel better creating "home"? these are wonderful! I want a whole collection! Wicked cute. I'm glad Mr. Hillsy was paying attention. What a great idea Marichelle! 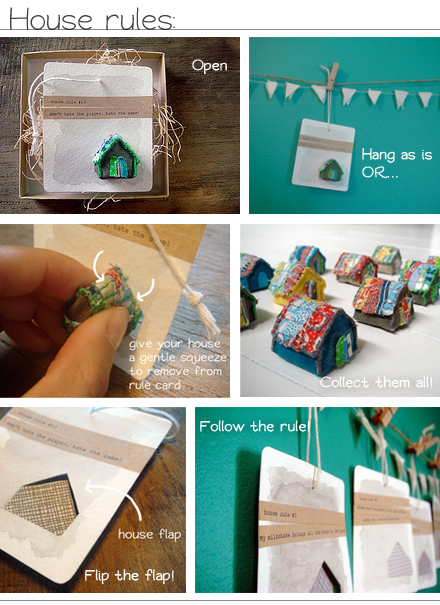 Those tiny houses are adorable and the house rules are a riot!! And I see they are already selling... woohoo! Love the entire concept! brilliant, funny, and sweet! OH! I let out a little squeal when I saw these houses! They're FABULOUS!!! I linked to this post on Craft Gossip Sewing Blog (sewing.craftgossip.com). The post will be active on March 1. Hopefully it will bring a few more clicks your way.